During his time at Edwards, then-Sgt. 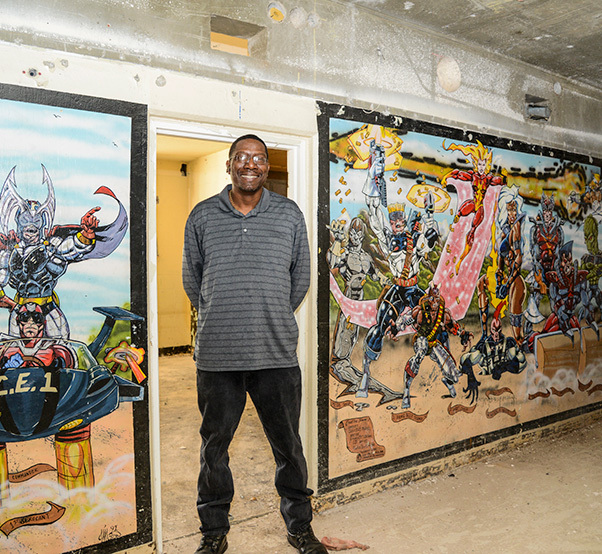 Gregory Wilson painted murals in the Health and Wellness Center, Dorm 2424 and at two fire stations. Two of those murals are still displayed today such as this one at the Health and Wellness Center located next to the Rosburg Fitness Center. Wilson came to Edwards in 1990 as a civil engineering fire protection specialist, and shortly after his arrival, people started to notice his artistic talents. 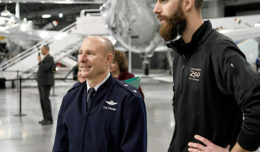 Wilson was raised in an underprivileged area of southeast Washington D.C. After spending some time in college, he decided to create a better life for himself and joined the Air Force in 1986. The Air Force sent him to Okinawa, Japan, where he tried to secure a job as a photographer but was denied because of his uncorrected vision. Instead, he was placed in fire protection services as a driver and crew chief. Four years later he arrived at Edwards AFB and took residence in Dorm 2424. At that time, the dorm housed members of the 6500th Civil Engineering Squadron. 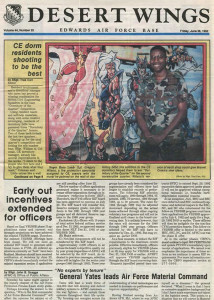 According to an article published in the base newspaper, the Desert Wings, in 1992 the residents of Dorm 2424 had garnered three Dormitory of the Quarter honors and wanted to bring home award number four. The mural painted by Wilson was just one of the ways the dorm residents planned to catch the judge’s attention. Wilson didn’t work on the mural alone. A Senior Airman Christopher J. (CJ) Mahon came up with the idea of representing each of the disciplines in civil engineering as a superhero. Former Sgt. 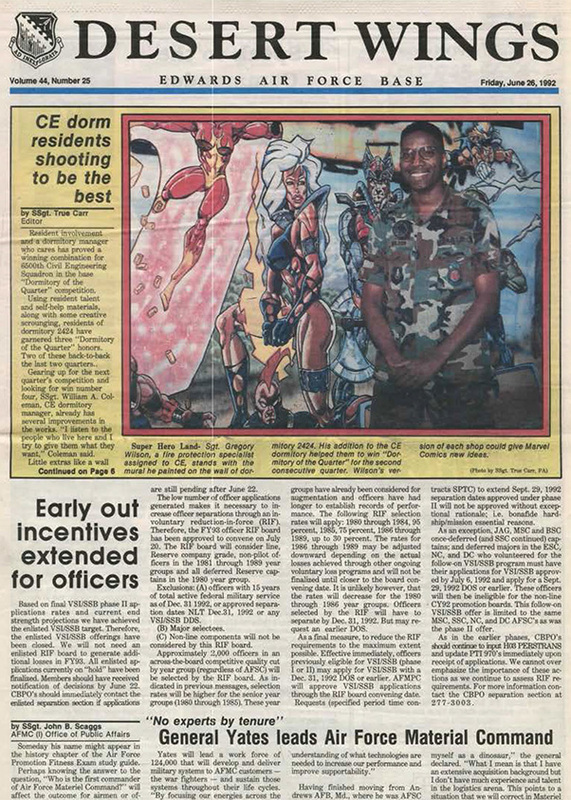 Gregory Wilson was featured in the June 26, 1992, issue of the Desert Wings for his work on the 6500th Civil Engineering Squadron dorm wall. The mural was part of an effort to bring home a Dormitory of the Quarter Award. For the next several weeks on his off time, Wilson worked on the mural. He sketched out the characters and then recruited the help of Charles Hughes to fill in color. Each character was designed to reflect the shop it represented. For instance, the heat shop’s character has flames coming out of her hair, the rocket lab is streaming across the sky, the metal shop guy is melting and waste management is in a storm drain. Some characters were more difficult to portray than others such as administration. He decided to make her a “very strong female” because of the amount of paperwork they had to handle each day. All of their efforts paid off and they did win the Dormitory of the Quarter again. Twenty-three years later, Wilson and Mahon have kept in touch with each other. Wilson now works for the L.A. County Department of Parks and Recreation where he teaches art and computer classes to children, as well as running a youth basketball program. 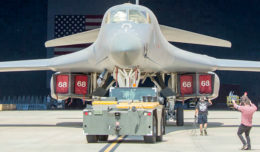 Mahon is the Fire Emergency Operations chief at Barksdale AFB, Louisiana. During his time at Edwards, Wilson also painted murals in the Health and Wellness Center and at two fire stations. Two of those murals are still displayed today. He also designed the fire department’s logo, which is still being used. According to Wilson, he started drawing when he was five years old. His father collected comic books and he loved to look at the pictures. As a boy, Wilson wanted nothing more than to make his mother proud. One day, he was able to do just that when he drew his first picture, the Incredible Hulk, without tracing. Local artist Gregory Wilson is pictured in Dorm 2424 in front of the comic book style mural he painted in 1992. The mural was uncovered several weeks ago during renovations to the building. As he grew older, the young, aspiring artist taught himself to draw by studying art books and reading about different techniques. Prior to entering the military, Wilson worked as an apprentice for a man who did illustrations in the Washington Post. Contrary to what the illustrator believed, Wilson was given many opportunities to paint in the Air Force, from wall murals to Christmas card contests. Of all of his Air Force paintings, the mural in Dorm 2424 is his favorite. Both Wilson and Mahon hope to see the work preserved for future generations to enjoy. “In my opinion it’s a tribute to the Airmen of CE from that time. We worked hard, we played hard and everything CE touched was golden,” said Mahon. The mural in Dorm 2424 was uncovered during renovations in Dorm 2424. The wall is already at its required structural strength. The 412th Civil Engineering Group has not stated whether the painting will be preserved or not.